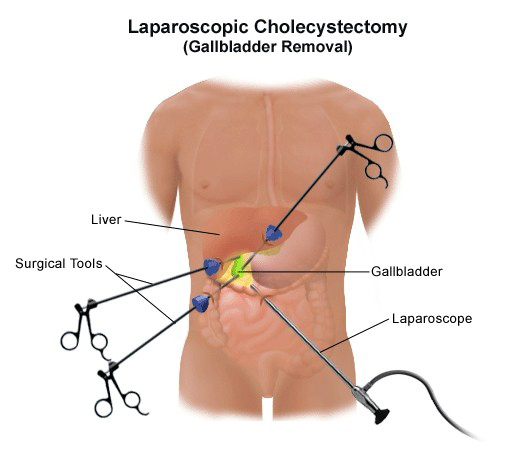 Cholecystectomy is a surgical procedure performed to remove your gallbladder with any gallstones. This is performed under general anaesthesia so you will not be aware during the procedure. More than 95% of time this should be feasible using a keyhole (laparoscopic) technique. This involves inflating the inside of the abdomen with gas to make space and see the internal organs better and inserting a tiny camera (laparoscope) to see inside the abdomen. Specialised surgical instruments are then used through small incisions, typically 0.5-1cm small, to remove the gallbladder. On occasions if your surgeon is concerned regarding the potential presence of small stones inside your bile duct or to check the anatomy a special x-ray test (cholangiogram) will be performed. The procedure may last from 1 to 2 hours. In some cases one large incision needs to be made under your right ribcage in order to remove your gallbladder called open cholecystectomy. After the procedure you will wake up in a hospital room. Laparoscopic cholecystectomy is normally performed as a day case operation but sometimes patients may need to spend a night in hospital. You are typically expected to go home once you are eating and drinking and are able to manage the pain and walk unaided. It normally takes about a week to fully recover from a laparoscopic cholecystectomy but it varies from person to person and depends on their general health. Open cholecystectomy requires a longer stay in hospital and a longer recovery time between 4 to 6 weeks. The procedure is normally very safe but like all procedures has a small risk of complications. This includes complications common to all surgical procedures such as infection, bleeding, blood clots, heart problems, pneumonia, urinary retention, anaesthetic risks and complications specific to this operation such as risk of bile leak, damage to structures near the gallbladder such as the liver, bile ducts and bowel. Some patients may also experience some temporary shoulder tip pain due to the irritation of the diaphragm by the gas used to inflate the abdomen but this normally goes away after 1-2 days. Your gallbladder is not essential for a healthy digestion. Most people would have no symptoms following their operation while a few may experience looser stools a symptom which usually resolves with time.